While we hope to never know what it’s like to be the victim of something as scary as a kidnapping, we also hope that — should it ever happen — we’re equipped with skills that might help us survive. Which is why we’re so glad one woman is sharing her story of how she escaped from a car trunk during a kidnapping. The woman, named Britanny Diggs, explained how quick-thinking and her insulin pump helped her to escape after a man held her at gunpoint and put her in the trunk of her own car. 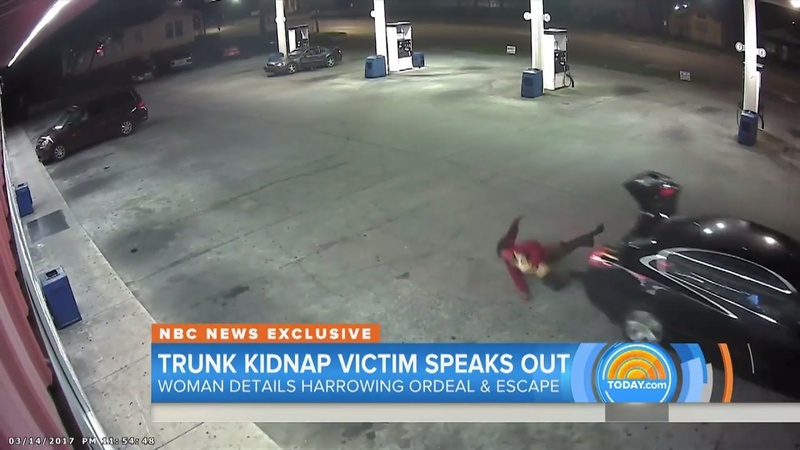 The 25-year-old nursing student is speaking out after her dramatic car trunk escape, telling TODAY that she was approached by a man while walking home to her apartment near Birmingham, Alabama. The man held a gun to her head and asked her for money, and when she said she had none, he forced her into her car and told her to drive him to another part of town. Diggs was understandably panicked as he continued to drive around, fearing he would “drive the car into a river,” leaving her to drown. HOWEVER, she remembered seeing a Facebook video which described how to open a car trunk from the inside, and Diggs used the light from her insulin pump to open the latch of the trunk as he pulled away quickly. Here’s a video of the escape, as well as what you should do if ever caught in a trunk. Her escape was caught on security cameras at a gas station, and Diggs was able to run into the station where the owner called police. Though the suspect is still at large, Diggs was able to flee to safety thanks to her incredible quick thinking. We’re so glad she’s safe and telling her story!